The first chapter of the story Two Dates proved to be quite popular. The story will have 4 chapters in all. Here is the second one. Here is a mind map for the second chapter of the story Two Dates. In my opinion the ideal way to proceed with this post is to learn the vocabulary first. 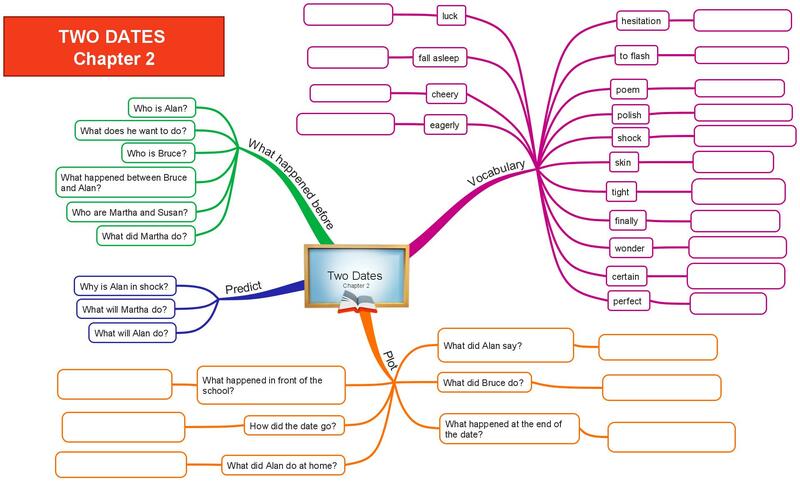 Print out the mind map and then complete the Vocabulary branch. Once you have studied the vocabulary from the mind map, it is useful to practise the words in the following games. The first one is called simply Memory Game and your task is to remember the words that appear in the center of the screen and then click on them. This game is in HTML 5 so it will play on your mobile phone too. I have managed to get to level 14. Will you be better? Once you know the vocabulary watch the video here and try to undestand it. Once you finish the video answer the questions in the mind map. “Y…yes of course!” He smiled shyly at Martha. “Great!” Martha flashed another one of her perfect smiles and turned around, returning back to her seat beside Susan. Susan looked back at Alan and smiled, waving at him. He waved back. He could not believe his luck! Bruce saw the whole exchange and left Alan alone. Alan waited nervously for Martha after school, by the gates. He kept a look out for her, and scanned the crowd for a pretty girl in a yellow floral dress. To his surprise, Martha met him in a completely different outfit. She must have changed before meeting him. Yet again, she showed off her perfect figure in skin-tight jeans and a white t-shirt. “Ready?” Martha held out her hand, waiting for Alan to take it. He took it without a moment’s hesitation. They spent the afternoon at the ice cream shop in town. Martha wanted Alan to buy her ice cream, which he did. He did not have much money on him that day, only enough for a single ice cream cone, so he let Martha have it. He watched her polishing off the chocolate-flavored ice cream. “Alan, how can you not have money with you?” Martha asked surprised and shocked. She rolled her eyes as she took another lick off her ice cream. Alan blushed. He was not expecting to go out at all, so of course he did not have much money on him. “That’s okay, I’m not hungry,” he told Martha, watching her eat. After their ice cream date, Alan walked her home. She did not bother saying goodbye as she walked into the driveway of her house, but Alan waved anyway. He was in love. He could not stop thinking about her even at home. Alan decided to write Martha a poem. Running eagerly to his computer, he started the word processor and typed. Alan decided to send it to Martha’s email. Alan woke up the next morning, happy and cheery that that morning would be the first day to a whole new different Alan. He wondered if Martha had seen his email yet. When he turned on his computer, he had the biggest shock of his life.